We value all of the brands that send us products for our Kid Influencer events. As always all opinions are honest and my own. I like to hide during the winter. If it was up to me, I would spend the entire winter in fuzzy socks, a sweatshirt, and leggings while sitting under a warm blanket watching Netflix. If that’s my idea of a perfect winter, you might wonder how I ended up co-hosting the most recent #JustAPlayDate outside during a thirty-four-degree day! 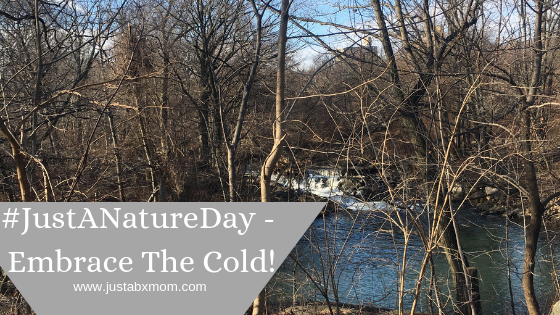 It’s simple, my little loves nature and being in it regardless of the temperature. When you live in NYC the idea of spending the day in nature isn’t necessarily your go to plan. The thing is, NYC is filled with nature if you’re willing to look. In fact, if you ask JustaBXgirl she will tell you that the Bronx Zoo is her backyard. I guess that makes the animals in the zoo her pets! Thank goodness I don’t have to walk the hyenas! We hadn’t been to a Nature Club at the Bronx Zoo in a while so when JustaBXgirl asked if we could go I reached out to Karina at C’est La Vie and we decided that it was the perfect setting for our January JustAPlayDate and the vision of #JustANatureDay was born. We reached out to the Bronx Zoo’s Nature Club and they were happy to have us and our kid influencers join their group for the day. Because we would be out exploring and interacting with nature we didn’t want to bog our kidfluencers down with STUFF. This playdate was about the exact opposite. We wanted the kid influencers to enjoying being unplugged and finding joy in the simplicity of playing outdoors. And they did. Our little nature explorers had a blast learning how to make nature weaves, spend some time bird watching, and dug in the dirt to find worms! Yes, our littles were not afraid to LITERALLY get their hands dirty. We wanted to make sure that the kid influencers had enough energy to not only spend the morning in nature but the afternoon exploring the Bronx Zoo so we made sure to pack a bunch of Slammers. You’ve probably seen JustaBXgirl snacking away on Slammers over on social media. She loves these so they were a no brainer to partner with them for this event. It seemed as if all of the kid influencers enjoyed Slammers Snacks as much as we do. They come in a variety of flavors for even your pickiest eaters. Chillin’ is JustaBXgirl’s favorite flavor if you’re wondering. What is Chillin’? It is blueberry, butternut squash, greek yogurt and, YUMBERRY. We ended the afternoon with about half of our group venturing into the zoo. Winter is a fun time to visit the zoo. It is much quieter than it is during warm weather months but there is still so much to do there. I love how you can visit the zoo and be transported to so many different places and learn so much while enjoying the day walking around being unplugged. You don’t have to worry about it being too cold outside because you will be moving around plus there are plenty of indoor exhibits to check out. Some of our favorites are the Reptile House and Madagascar. Sadly, the 4D theater has been taken down. Yup, the whole building is gone!!! I believe it is being rebuilt but for now, we really miss it! We are hoping to get back for another winter visit later this month. Maybe we will see you there!! !